Most designers and stylists suggest having at least one thing that's truly alive in every room in the house. When it comes to girls' rooms, especially tweens, fresh flowers are an excellent choice. 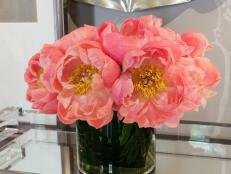 One of the most beloved cut flowers for designers is the architectural and feminine peony. As beloved as the peony is, it can be a pricy addition at $35 per bunch. Consider tulips as a great alternative — they last approximately a week and cost between $8-$12 per bunch. 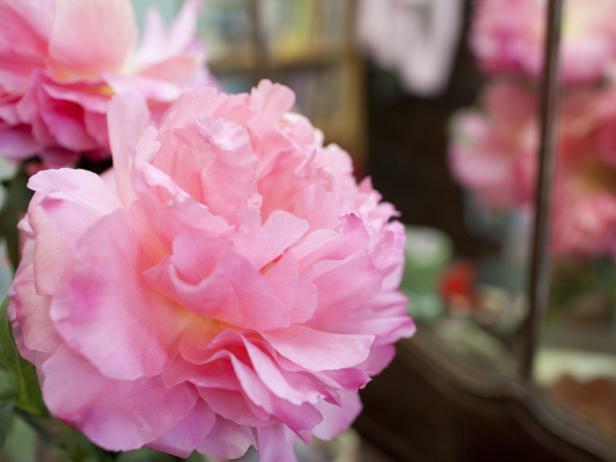 Wondering how to grow peony plants? This perennial is a low-maintenance charmer that settles into the garden for the long haul. Peony plants typically survive decades, gracing the landscape with a spring show for many generations. Growing peonies isn’t difficult. You can definitely master raising this bloomer, and you can even tackle growing peonies in pots. Growing peonies starts with making sure this beautiful bloomer is adapted to your region. Peonies are hardy in Zones 2 to 8, depending on the variety. Choose a planting spot for peony that’s in full sun all but the warmest zones. 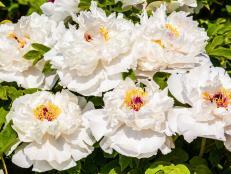 In these locations, including places like the South, Desert Southwest, Texas or Southern California, plan on growing peonies in an area that receives morning sun and protection from the sun during the hottest part of the day. Peony growing can be a little tricky in warmest regions because peonies need chilling hours to bloom. A chilling hour is an actual hour (60 minutes) when air temperature remains between 32°F and 40°F. Peonies need a total of 500 to 1,000 chilling hours to flower. In the West, peonies grow best at higher elevations, where chilling hours accrue readily. In the South, growing peonies that flower can be pretty tough if you garden south of Birmingham, Alabama. Before you can start growing peonies, you need to get some plants. 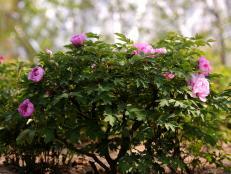 Most peonies are sold as bare-root plants for fall planting. If you order from peony specialty nurseries, they usually dig peony tubers in late summer and early fall and ship them at the correct planting time for your region. 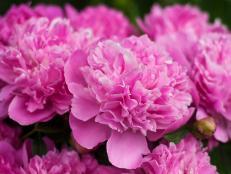 You may also find potted peonies for sale at garden centers in spring. If you do buy potted peonies and opt for spring planting, aim to get plants in the ground well before the arrival of summer heat. Peony roots are actually tubers, similar to potatoes. 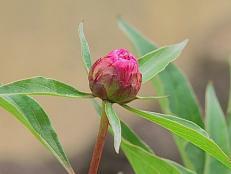 Peony tubers have eyes or growing points, where new growth emerges. These eyes are typically reddish in color. 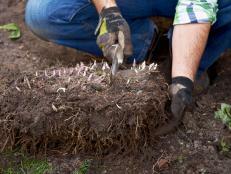 When you buy peony roots, you should see two or more eyes on each tuber. When you order or purchase peony tubers locally, follow the seller’s directions carefully to store tubers prior to planting. Typically you can store peony roots in the original packing material for 7 to 10 days. 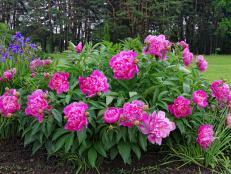 When growing peonies, mix plenty of compost and organic matter into soil. 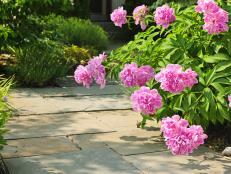 Because peonies are long-lived perennials, it’s important to make sure you give plants a fertile foundation. 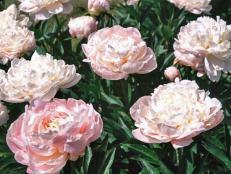 The secret to growing peonies in pots is to blend topsoil with perlite or organic matter like compostedmanure or humus. Aim for a ratio of 65 percent topsoil to 35 percent organic matter. Avoid typical bagged container growing mixes; they hold too much moisture for potted peonies to thrive. 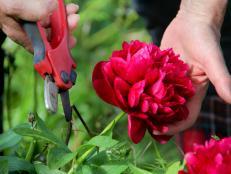 Plan to add peony supports to help hold stems upright, especially when flowers start to open. A fully open peony bloom can easily bend a stem to the ground, especially when wet. Use open hoop-type or grow-through peony supports that encircle the plant. Create your own by using bolt cutters to cut apart tomato cages into individual hoops. It’s easiest to insert stakes around plants when new growth appears in spring.